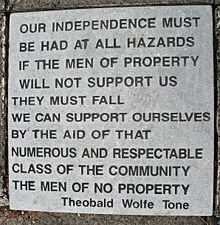 Theobald Wolfe Tone, commonly known as Wolfe Tone (20 June 1763 – 19 November 1798), was a leading Irish revolutionary figure and one of the founding members of the United Irishmen and is regarded as the father of Irish republicanism. He was captured by British forces at Lough Swilly in Donegal and taken prisoner. Before he was to be executed, Wolfe Tone attempted suicide and subsequently died from his wounds eight days after the attempt, thus avoiding being hanged as a convicted traitor to the British Crown for his involvement in the 1798 Irish Rebellion. Theobald was born in Dublin, the son of a Church of Ireland coach-maker, Peter Tone, who had a farm near Sallins, County Kildare. He was baptised as Theobald Wolfe Tone in honour of his godfather, Theobald Wolfe of Blackhall, County Kildare, a first cousin of Arthur Wolfe, 1st Viscount Kilwarden. However, it was widely believed that Tone was the natural son of Theobald Wolfe. In 1783 Wolfe found work as a tutor to Anthony and Robert, younger half-brothers of Richard Martin (M.P.) of Galway, a prominent supporter of Catholic Emancipation. He had an affair with Martin's wife, in his townhouse in Galway, now Tigh Neachtain Pub, and narrowly escaped a duel with Martin. During this period he briefly considered a career in the theatre as an actor. He studied law at Trinity College, Dublin, where he became active in the debating club, the College Historical Society, and was elected Auditor in 1785. He qualified as a barrister from King's Inns at the age of 26 and attended the Inns of Court in London. As a student, he eloped with Martha Witherington, daughter of William Witherington of Dublin, and his wife, Catherine Fanning. She would go on to change her name to Matilda, on Wolfe Tone's request. Disappointed at finding no support for a plan to found a military colony in Hawaii that he submitted to William Pitt the Younger, Tone turned to Irish politics. A 1790 pamphlet attacking the administration of the Marquess of Buckingham brought him to the notice of the Whig club; in September 1791 he wrote an essay by "A Northern Whig," 10,000 copies of which were said to have been sold. Ireland at this time – and especially among the Presbyterians of Ulster – had started to embrace with eagerness the principles of the French Revolution. Two months before the publication of Tone's essay, a meeting had taken place in Belfast, where the drinking of republican toasts and a resolution in favour of the abolition of religious disqualifications gave the first signs of political sympathy between the Roman Catholics and the Protestant dissenters ("Whigs") of the north. "A Northern Whig" emphasised the growing breach between Whig patriots like Henry Flood and Henry Grattan, who aimed at Catholic emancipation and parliamentary reform without severing the tie to England, and those who desired a separate Irish republic. Tone expressed contempt for the constitution Grattan so triumphantly extorted from the British government in 1782; himself an Anglican, Tone urged co-operation between the different religions in Ireland as the only means of obtaining redress of Irish grievances. In October 1791 Tone converted these ideas into practical policy by founding, in conjunction with Thomas Russell (1767–1803), Napper Tandy and others, the Society of the United Irishmen. This society aimed originally at no more than the formation of a political union between Roman Catholics and Protestants, with a view to obtaining a liberal measure of parliamentary reform. Only when it became obvious that this was unattainable by constitutional methods did the majority of the members adopt the more uncompromising opinions which Wolfe Tone held from the first, and conspired to establish an Irish republic by armed rebellion. Tone himself admitted that with him hatred of England had always been "rather an instinct than a principle", though until his views should become more generally accepted in Ireland he was prepared to work for reform as opposed to revolution. But he wanted to root out the popular respect for the names of Charlemont and Henry Grattan, transferring the leadership to more militant campaigners. Grattan was a reformer and a patriot without democratic ideas; Wolfe Tone was a revolutionary whose principles were drawn from the French Convention. Grattan's political philosophy allied itself with that of Edmund Burke; Tone was a disciple of Georges Danton and Thomas Paine. Paine was a roommate of Tone's compatriot, "Citizen Lord" Edward FitzGerald, in Paris; and Paine's famous themes of the "rights of man" and "common sense" appear in the opening paragraph of the Declaration of the United Irishmen. Note the importance of the use of the word "united". This particularly alarmed the British aristocracy in Westminster, as they saw the Catholic population as the greatest threat to their power in Ireland. Catholics had additional concerns of their own, usually involving having to pay the tithe bill to the Anglican Church of Ireland and the rent necessary to lease land from the Protestant Ascendancy. Eighteenth century Ireland was a sectarian state, ruled by a small Anglican minority, over both a majority Catholic population (most of whose ancestors had lost their land and their political power in the 17th-century Plantations of Ireland), as well to the exclusion of Presbyterian and dissenting Christians from high political office. The religious dividing-lines in part also marked ethnic divisions, the Catholics and Presbyterians descending from native Irish, Normans, "Old English", and Scottish settlers, and the "Protestants" (Church of Ireland) more often from English settlers (as in the case of Tone's family). In this era and place, importantly, "Protestant" referred specifically to the state-sanctioned (Anglican) church, rather than to what today would be broadly referred to as "Protestantism"; many of what would be today called "Protestants" (but not Episcopalian/Anglican/Church of Ireland) would have then referred to themselves as "dissenters". Existing sectarian animosity did threaten to undermine the United Irishmen movement: two secret societies in Ulster fought against each other, the Peep O'Day Boys, made up mostly of Protestants, and the Defenders, comprising Catholics. These two groups clashed frequently from 1785 and sectarian violence worsened in the county Armagh area from the mid-1790s. Sectarianism was deliberately fostered[by whom?] to undermine Wolfe Tone's movement, as it suggested that Ireland couldn't be united and that religious prejudices were too strong. In addition, the British authorities could mobilise the militant Protestant groups – including the newly founded Orange Order – against the United Irishmen. However these groups were largely based in Ulster, and the underlying reason for their conflicts was the growing demand for rented land, not religion per se. However, democratic principles had started gaining ground among the Catholics as well as among the Presbyterians. A quarrel between the moderate and the more "advanced" sections of the Catholic Committee led, in December 1791, to the secession of sixty-eight of the former, led by Lord Kenmare; and the direction of the committee then passed to more violent leaders, most prominently to John Keogh, a Dublin tradesman, known as "Gog". The active participation of the Catholics in the movement of the United Irishmen gained strength with the appointment of Tone as paid secretary of the Roman Catholic Committee in the spring of 1792. Despite his desire to emancipate his fellow countrymen, Tone was a freethinker who sought to remove the Christian religion fron Ireland, and thus had very little respect for the Catholic faith (a view shared by many subsequent Irish republicans). When the government questioned the legality of the Catholic Convention in 1792, Tone drew up for the committee a statement of the case on which a favourable opinion of counsel was obtained; and the Convention voted to Tone a sum of £1500 with a gold medal when it dissolved itself in April 1793. A petition was made to the king early in 1793 and that year the re-enfranchisement of Catholics was enacted, if they had property as "forty shilling freeholders". They could not, however, enter parliament or be made state officials above grand jurors. Burke and Grattan were anxious that provision should be made for the education of Irish Roman Catholic priests in Ireland, to preserve them from the contagion of Jacobinism in France; Wolfe Tone, "with an incomparably juster forecast", as Lecky observes, "advocated the same measure for exactly opposite reasons". He rejoiced that the breaking up of the French schools by the revolution had rendered necessary the foundation of St Patrick's College, Maynooth, which he foresaw would draw the sympathies of the clergy into more democratic channels. In 1794 the United Irishmen, persuaded that their scheme of universal suffrage and equal electoral districts was not likely to be accepted by any party in the Irish parliament, began to found their hopes on a French invasion. An Irish clergyman, the Reverend William Jackson, who had taken in revolutionary opinions during his long stay in France, came to Ireland to negotiate between the French committee of public safety and the United Irishmen. Tone drew up a memorandum for Jackson on the state of Ireland, which he described as ripe for revolution; the memorandum was betrayed to the government by an attorney named Cockayne, to whom Jackson had imprudently disclosed his mission; and in April 1794 Jackson was arrested on a charge of treason. Also in 1794 the society became a sworn association, using oaths that were clearly designed to overthrow the state. Given that France and Britain had been at war since early 1793, administering or making such oaths turned the society into something more than a liberal pressure group. Several of the leading United Irishmen, including Reynolds and Archibald Hamilton Rowan, immediately fled the country; the papers of the United Irishmen were seized, and for a time the organisation was broken up. Tone, who had not attended meetings of the society since May 1793, remained in Ireland until after the trial and suicide of Jackson in April 1795. Having friends among the government party, including members of the Beresford family, he was able to make terms with the government, and in return for information as to what had passed between Jackson, Rowan and himself, he was permitted to emigrate to the United States, where he arrived in May 1795. Before leaving, he and his family travelled to Belfast, and it was at the summit of Cavehill that Tone made the famous Cavehill compact with fellow United Irishmen, Russel and McCracken, promising "Never to desist in our efforts until we subvert the authority of England over our country and asserted our independence". Living in Philadelphia, he wrote a few months later to Thomas Russell expressing unqualified dislike of the American people, whom he imagined to be no more truly democratic in sentiment and no less attached to authority than the British; he described Patriot hero George Washington as a "high-flying aristocrat," and he found the aristocracy of money and achievement in America still less to his liking than the European aristocracy of birth. Tone also lived briefly in West Chester, Pennsylvania and Downingtown, Pennsylvania. "Wolf Tone was sent to France to claim the support of the Directory, under the express condition that the French should come to Ireland as allies, and should act under direction of the new government, as Rochambeau had done in America. With this view, Tone had frequently conferendes at Paris with Hoche; and the Directory finally determined to send from Brest a fleet of forty-five sail, with an army of fifteen thousand men, under the charge of this able general, December 15, 1796. England was saved by a violent tempest." Tone did not feel himself bound by his agreement with the British government to abstain from further conspiracy; and finding himself at Philadelphia in the company of Reynolds, Rowan, and Tandy, he went to Paris to persuade the French government to send an expedition to invade Ireland. In February 1796 he arrived in Paris and had interviews with De La Croix and Carnot, who were impressed by his energy, sincerity, and ability. A commission was given him as adjutant-general in the French army, which he hoped might protect him from the penalty of treason in the event of capture by the British; though he himself claimed the authorship of a proclamation said to have been issued by the United Irishmen, enjoining that all Irishmen taken with arms in their hands in the British service should be instantly shot; and he supported a project for landing La Legion Noire in England, who were to burn Bristol, England and commit other atrocities. He drew up two memorials representing that the landing of a considerable French force in Ireland would be followed by a general rising of the people, and giving a detailed account of the condition of the country.